In order to help students in the lower Basico grades (ages 7-13), our field volunteers assist local teachers (at their request) in their classrooms. Since many of the classrooms have a high student to teacher ratio and some teachers may be teaching multiple grades at once, our volunteers help bring that ratio down thus improving the learning environment. 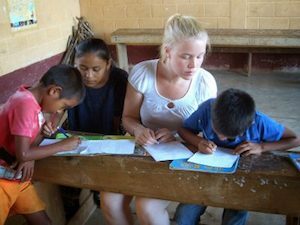 It can also be great personal development for our volunteers to gain teaching experience or to share their own teaching strategies with the schools. 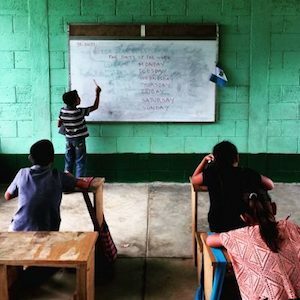 In Guatemala, students only attend public school in the mornings. Through our Volunteer Program, we are able to offer a wide range of afternoon activities to the local school children that combine learning with having fun. They can choose between various activities ranging from arts & crafts, playing educational games, sports, Spanish & English classes, and reading. Many of these courses are based on the unique skills of our volunteers so the options are endless! As of April 2018, our Knowledge & IT Center was completed which allows us to provide a free computer lab to support students (and adults) within the community. The lab is open for students to conduct their own research or play educational games (such as Khan Academy) but our volunteers also offer classes on typing, how to use the Internet and Microsoft Office applications, and basic coding. Our Knowledge and IT Center also has a small library that is available to the community as well. We have a One-on-One Literacy Tutoring program that trains middle school students on how to teach younger students basic reading and writing skills. This program gives agency to our older students, so they can help tutor the younger children in their families and the community. In addition to afternoon activities, each year Li Ch’utam invites graduating 6th graders on a year-end field trip outside of the valley. These trips are very well received by teachers and students alike and offer a rare opportunity for the children to explore beyond their village and learn more about their heritage and country. Popular field trips include visiting museums in Guatemala City and the Maya ruins of Tikal! 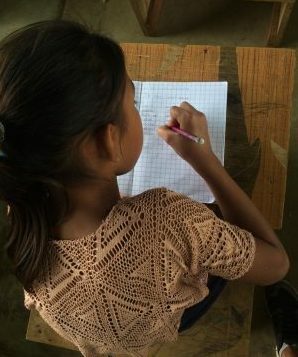 Secondary education (starting at 13 years old) is not publically funded in Guatemala and therefore costs must be covered by families. Most of the families in the Polochic Valley are very poor so our scholarships cover tuition, transportation, supplies, and other school fees. We work closely with the families in the valley to understand their income level and any other challenges students may face in the home to better tailor our assistance to them. With the support of private contributions, we are able to ensure a child’s access to further education. Li Ch’utam works beyond the children of the valley and has built strong relationships with many of their families as well. Our family oriented projects aim to provide broader support to families while also giving them the opportunity to work together and have fun as a unit. 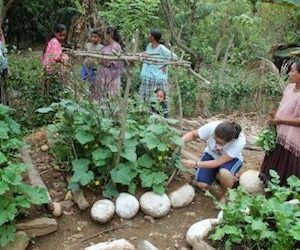 Vegetable Garden: We grow a variety of fruit and vegetables in a cooperative garden in the village of Nueva Mercedes. The goal of this activity is to help families, and especially the mothers, either supplement family income and/or grow their own produce for a healthy and balanced diet for their family. 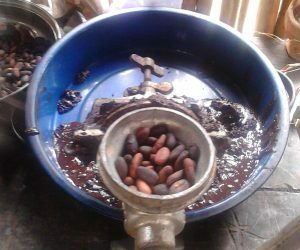 We also incorporate lessons on planting/harvesting techniques and other technical agricultural support. Adult Courses: As mentioned above, many of our computer courses are also available to adults within the community, allowing them to improve their computer skills. In today’s age, having these skills can drastically improve their career opportunities and thus their livelihood.